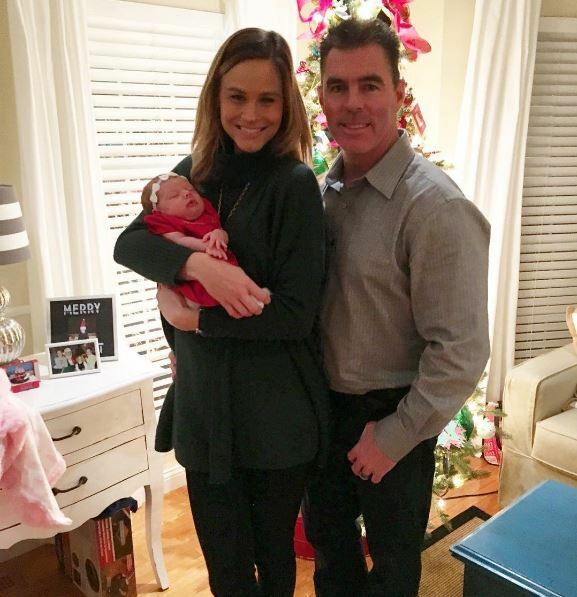 Meghan King Edmonds has been reveling in her role as new mommy ever since baby girl Aspen was born – her first biological child with hubby Jim Edmonds. But make no mistake! The Real Housewives Of Orange County star hasn’t put all of the show’s drama behind her. In particular, costar Vicki Gunvalson is still a hot topic of conversation and a perpetual thorn in her side. Meghan dishes on Vicki – and much, much more – in a recent interview on The Domenick Nati Show. But first, Meghan has some ideas about adding fresh blood to the RHOC cast. Friends with Audrina Patridge from The Hills, Meghan says that Audrina would make a great Real Housewife. “I’d love it! She has a baby; she’s my age. Right there, that’s a lot in common. She breastfed, I breastfed.” Mmmkay. Twinsies, then! Vicki Gunvalson On “Resurrecting” From Brooks Ayers, Shannon’s Unhappiness, And Wanting A Spinoff With Tamra! The Vicki Gunvalson denial tour rages on! In a revealing interview Vicki doesn’t hold back in discussing her complicated relationships with her cast mates, rebounding from Brooks Ayers, and why she’s begging everyone to move on. Oh, she also wants a spinoff with friend/enemy Tamra Judge. Huh? This season of Real Housewives Of Orange County has Vicki avoiding drama – or trying to – and focusing on rebuilding. “I’m filling my tank back up!” This means a lot of whooping it up while re-evaluating her friendships. For a guy who claims he wants to live a private life away from the spotlight, Brooks Ayers sure spends a lot of time talking to the press. The former Real Housewives of Orange County cast member is now giving statements about wanting to be left out of future conversations, especially those regarding his cancer storyline. Just when we had almost forgotten him, Brooks pops back up by giving yet another statement, with his version of the past five years of his life with Vicki Gunvalson. And begging to be left alone to live a quiet and private life battling his disease and working on his career. Brooks Ayers Shopping A “Tell All” Interview Around; Wants Vicki Gunvalson to Join Him On Air! Just when we thought our Brooks Ayers Cancer Storyline was in remission, it rears its bogus little head again! Word on the street is that Brooks is shopping around a “tell all” interview as a platform to discuss his cancer diagnosis and behind-the-scenes moments we didn’t see on last season’s Real Housewives of Orange County. Always the grifter hustler, Brooks is hopes to garner tens of thousands of dollars for his exclusive interview. He’s also hoping ex-girlfriend Vicki Gunvalson will join him! Whaaaaaa? Vicki Gunvalson Reacts To Debra Messing Saying She Knew Brooks Ayers Lied About Cancer; Lisa Vanderpump Defends Vicki! Whether or not Vicki Gunvalson knew Brooks Ayers was allegedly lying about having cancer continues to be a storyline looooong after Real Housewives Of Orange County wrapped. On WWHL, Debra Messing accused Vicki of being aware of Brooks’ lies. “She totally knew. Vicki knew. Ugh. She got me really, really mad,” the actress said. Predictably Vicki was not happy and got on twitter to defend herself. She also found an unlikely ally in Lisa Vanderpump, who took up Vicki’s case against Debra by calling her out! Vicki Gunvalson Dating New Man: Construction Supervisor Jack Losey! Brooks? Brooks WHO? 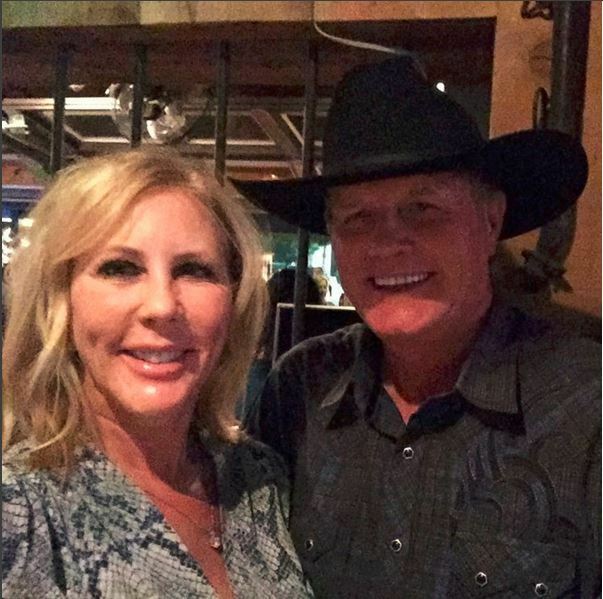 That’s what Vicki Gunvalson seems to be projecting with her latest post to Instagram showcasing new man Jack Losey. Is she hoping we see a new love interest and forget all about HE WHO FAKES MEDICAL RECORDS? Or perhaps her love tank was just sputtering on “E” for one month too long. Whatever the case, Vicki seems to have moved on for publicity’s sake to new romantic pastures. “Last night in Scottsdale. Thanks Jack for dinner and dancing at our favorite place. #tripisending,#allworknoplayisboring,” the Real Housewives of Orange County star captioned her photo, alluding to the couples’ romantic weekend spent in Scottsdale, Arizona. Brooks threatened to expose Vicki Gunvalson, Briana Culberson, the Real Housewives of Orange County producers, and Bravo for the manipulations and lies that went into making him look bad over the years. For reasons I will never understand, Brooks said he’s “not contractually bound by anything to not share” what he knows. While that may be true for Bravo, Vicki isn’t having it. In a last ditch effort to convince Real Housewives of Orange County fans that he’s not a liarface, Brooks Ayers is writing a tell-all book, in which he calls out producers for fabricating the “cancer gate” storyline for ratings. About RHOC producers, Brooks says, “They basically pitched me as this poor guy from Mississippi preying on a vulnerable, successful, self-made woman. I’m not bound contractually by anything to not share the intel about what transpires behind production, Bravo, what they try to do, etc.” Who is going to believe this “intel” from someone who faked test results and chemotherapy bills?! ?